Both quite handy little bits. Sorin, the maker, would just adore some feedback if anyone would care to share. So my buddies and I are making a mean meat manicotti for din-din of a Sunday and I'm sent off to the store for the appropriate vino. Money's a titch on the tight side and I wanna come back with something new, fun and tasty. My first inclination is something in sangiovese, but so many of my faves in the Italian section have inched their way over the $10 mark. So I do something rare and ask the wine guy what he thinks. 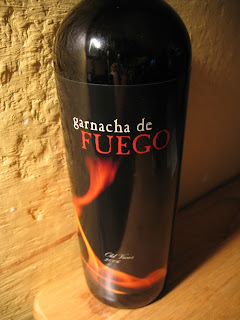 He guides me over to the Spanish section and palms me a sleek black bottle with flames licking the logo. Spain is a great place to go for mas fuego por el dinero. There's a lot of old vine vino on the market for beee-yootiful prices (why? My guess: old wineries with little exposure need only upgrade their vinification equipment and slap on a great label) and this little gem from Catalayud is a perfect example. Brimming with juicy forward red berry fruit with a touch of smoke and white peppery spice, it just charmed the hell out of me. It stood up fine both to the manicotti and to Ridley Scott's battle scene between the Roman Empire and the heathens of Germania (love love love it!) and left me mellow enough to admit that, despite myself, I still think Russell Crowe is a huge hottie in a Roman uniform. Once again I have to preach: find your under $10 bottles from somewhere else besides California. I guarantee that Spanish, Portugese, French and Italians have more depth and finesse for the money. Why? I dunno, maybe 'cause they've been producing table wine for, like, centuries. They always seem to offer more than just the juicy, flabby fruit of cheap California wine...a little more spice, a bit more personality. Prove me wrong. Please. 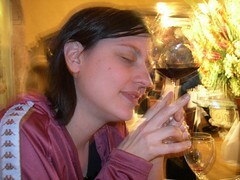 If you know of a charming (not merely drinkable, but charming) wine under $10 from the States, bring it on. We'll have a taste-off.